Kiehl's Hydro-Plumping Re-Texturizing Serum Concentrate: The latest skincare product from the company! One of the things that the Hydro-Plumping Re-Texturizing Serum Concentrate boasts is 15% glycerin, along with Shiso Leaf Extract. I know what you're thinking: "Musicalhouses, this sounds fantastic, but why is this advertised as such a new product when glycerin is already in virtually all the moisturizers out there? And 15% doesn't sound all that high to me, is it really a significant percentage to advertise?" And that my friend, would be a very intelligent question to ask indeed, if you did indeed ask it (if you did - you have awesome critical thinking skills, yay!). So I thought I'd start off by exploring what exactly is so new about the Hydro-Plumping Re-Texturizing Serum Concentrate? And of course, to do that, we start off at the ingredients list. 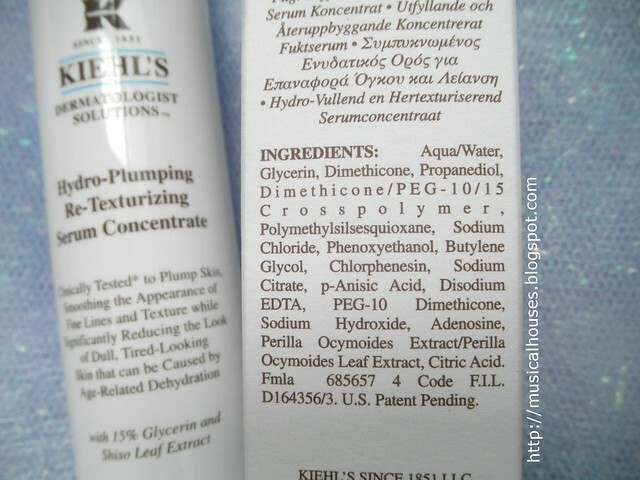 Kiehl's Hydro-Plumping Re-Texturizing Serum Concentrate: With 15% glycerin to hydrate skin. If you look at the ingredients list, you'll see ingredients that are all already very familiar - there's Water, then Glycerin, which we all know as a humectant, and which we know constitutes 15% in the product, so everything after Glycerin is 14% or less in concentration in the product. This includes Dimethicone, a silicone with emollient properties, Propanediol, which is a solvent that also has hydrating properties, and Dimethicone/PEG-10/15 Crosspolymer, a silicone-based film-former, Polymethylsilsesquioxane, a silicone with emollient properties, and that also functions as a slip agent, The main preservative here is Phenoxyethanol, which is typically used in products of concentrations of up to 0.1% (this is pretty much true all around the globe, including Japan and Europe, as well as in the US), so anything after Phenoxyethanol is in concentrations of less than 0.1%, and is probably a fairly minor ingredient. Kiehl's Hydro-Plumping Re-Texturizing Serum Concentrate Ingredients: Humectants and emollients help to moisturize the skin. Now I know you're wondering, "That's great Musicalhouses, but what is this, then? It looks just like any other lightweight, silicone-based moisturizer to me?" And you'd be right. That it is indeed. 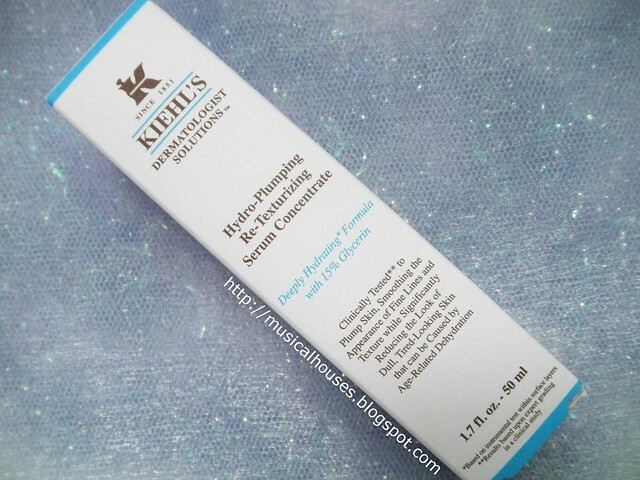 Kiehl's bills it as a "serum concentrate", but to me, the name of a product is really more a marketing-type of decision than an actual product-is-different-type trait. Over the nearly 5 years I've been a beauty blogger (ages in online time, I know), I've seen the same nearly-identical formula being billed as a serum in one brand, but in another brand as a moisturizer, and often that's because different brands decide to market their formulas differently to different audiences (although I won't go into it here - it would take up the space for one full post). That's okay by me, because I'm not particularly swayed by names since the ingredients are the first thing I look at, but the naming of a product does make a difference to other consumers who may specifically want something called a "serum" or a "lotion" versus a "moisturizer". I won't elaborate because this post is already pretty long, but suffice it to say, I think this could be some sort of moisturizing product - whether you want to use it as a serum under another cream, or as a moisturizer by itself, is totally up to you, and depends on how dry your own skin is and how you want to incorporate it in your own skincare regime. Also, I know some of you are probably wondering if 15% is really very high for a skincare product. Turns out, a concentration of 15% glycerin doesn't seem particularly high. After all, glycerin is typically used at up to 78.5% in leave-on products and 68.6% in rinse-off products. But what's new here is not the ingredients per se - after all, all the main ingredients in this product have been used over and over in other moisturizers. It seems that to Kiehl's, what is new is really the formulation - specifically the combination of ingredients, and the percentages of the individual ingredients in the product - rather than the ingredients themselves. 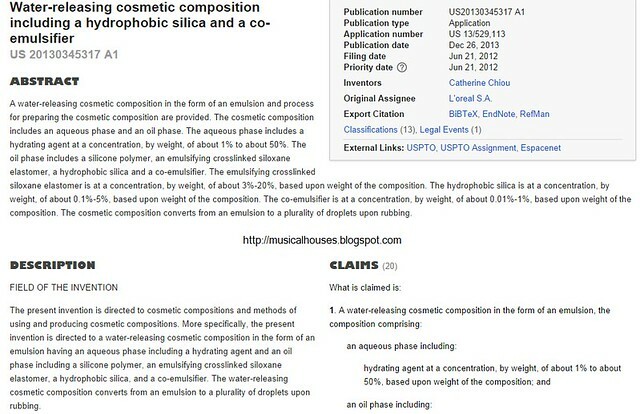 L'Oreal's 2011 patent for a "water-releasing cosmetic coposition" forms the blueprint for the Kiehl's product. In fact, L'Oreal, the parent comapany of Kiehl's, filed a patent in 2011 with a this almost exact formula, called "Water-releasing cosmetic composition". In the patent, L'Oreal described it as a product where "the aqueous phase includes a hydrating agent at a concentration, by weight, of about 10% to about 50%", while "The oil phase includes dimethicone at concentration, by weight of about 1% to about 25%," as well as "an emulsifying crosslinked siloxane elastomer at a concentration...of about 0.5% to about 7%", all by weight. The formula in that patent is pretty much a blueprint for the product. In the Hydro-Plumping Re-Texturizing Serum Concentrate, the "hydrating agent" is Glycerin, while the "dimethicone" is well, Dimethicone, and the "emulsifying crosslinked siloxane elastomer" would be Dimethicone/PEG-10/15 Crosspolymer. So there you go, L'Oreal essentially got a patent not for the ingredients, but the composition of the ingredients in specific percentages. 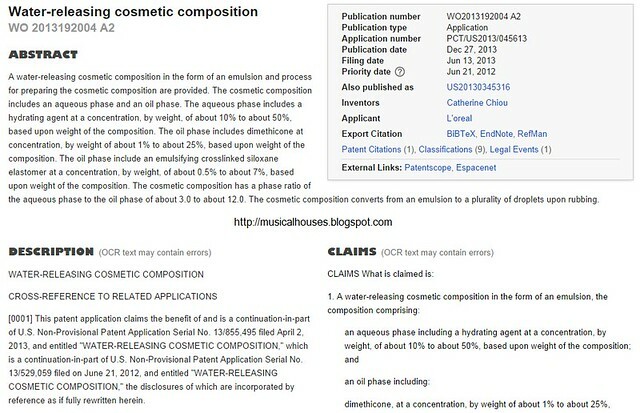 Interestingly, L'Oreal notes in their patent that "incorporating high levels of glycerin, generally greater than 5%, results in a cosmetic compositions having a tacky and sticky feel upon application to skin", so one of their arguments for why this formula is patent-worthy is that "the gel-like cream provides a unique and refreshing sensory experience without the tackiness associated with incorporating high levels of hydrating agents like glycerin into cosmetic compositions." I'm not sure how L'Oreal came up with that figure of 5%, especially since we already know glycerin is used in fairly high levels of up to 78.5% in leave-in products (although to be fair, this would include all types of skincare, not just products for the face). Perhaps L'Oreal is comparing their formula to other oil-in-water emulsions meant for facial use that don't feel tacky on the skin, but that's just a guess, since the patent leaves this unstated. L'Oreal's 2013 patent for a second "water-releasing cosmetic composition". And I suppose L'Oreal must really see the potential in this formula, because L'Oreal filed another very similar patent more recently in 2013, titled "Water-releasing cosmetic composition including a hydrophobic silica and a co-emulsifier", which is essentially a more refined, fleshed-out version of the original 2011 patented formula, including minor changes like the inclusion of a small amount of silica, use of a different type of "emulsifying crosslinked siloxane elastomer", as well as a specific preservative system, and an unspecified "active ingredient". Interestingly enough, none of these changes are incorporated in the Kiehl's Hydro-Plumping Re-Texturizing Serum Concentrate - but I take it as indication that we can expect such products coming forth from the L'Oreal group (if not Kiehl's) over the next few years! Exciting, huh? Now that I've highlighted what's new about the product, you're probably wondering, "Okay, thanks for doing all that work digging up patents, Musicalhouses, now, how does this benefit me, the consumer who is considering spending my money on this?" As you might guess from the name of the patent, the net effect of this particular mix of ingredients is a "water-releasing cosmetic composition". Water-releasing, huh? Turns out, the product is formulated to literally release its water content when applied to the skin, or as the patent says, "converts from an emulsion to a plurality of droplets upon rubbing." How is this done? When the consumer rubs the product on to their skin, "the shearing forces generated by the rubbing in or application of the cosmetic composition cause the water-in-oil type emulsion to rupture, thereby causing the internal aqueous phase to emerge in the form of droplets". So basically, the water content in the product is released when you rub the product into your skin, because the product is an emulsion, and the emulsion is formulated such that all the rubbing motion "breaks" the structure of the emulsion, thus releasing the water content in the form of water droplets. And of course, this is the new, exciting thing that was patented - as L'Oreal notes in the patent, "When the cosmetic composition is applied to the skin in a conventional way, the cosmetic composition quickly releases bead-like droplets containing the aqueous phase, bringing about a novel and soothing feeling to consumers." Kiehl's Hydro-Plumping Re-Texturizing Serum Concentrate: When it is first pumped out, it is a lightweight white gel. Now, putting that to the test - the above photo shows the Kiehl's Hydro-Plumping Re-Texturizing Serum Concentrate when pumped straight out of the bottle. As you can see, it looks like any other white, gel-like moisturizer. It feels very lightweight on the skin, and isn't greasy at all. But what happens when you start rubbing it into your skin? Behold, on your skin the gel seems to "turn into" little water droplets, as the photo below shows! Of course we know this is the emulsion rupturing and releasing the water inside, but it's still pretty cool nevertheless. And when you finish rubbing the gel (and the water droplets it releases) into your skin, the feeling that is left behind on your skin is one that is one that is lightweight and non-oily. In fact, L'Oreal described the skinfeel of the product best in its patent as "a fresher, less greasy, less tacky, and lighter feel", and that description is spot on. But I know what you're wondering: "Does it really have any benefit for me beyond turning into cute little water droplets when I rub it?" I think, if you've been reading my blog for awhile, you would have seen these ingredients explained in other skincare products, and you probably already know the answer. As you might guess, the main ingredients doing the work in this case are the humectant ingredients (Glycerin in this case), and the emollient ingredients (Dimethicone, Polymethylsilsesquioxane, and Propanediol, which also has humectant properties). So the product is mainly a good moisturizer that will both bring water to your skin (thanks to the humectants) as well as form an occlusive layer on your skin to prevent further TEWL (transepidermal water loss, or simply, water loss from your skin) and further dehydration of the skin (thanks to the emollients). So yes, it's a light moisturizer and will hydrate your skin without feeling oily, greasy or tacky, but beyond that, I wouldn't expect any miracles from it. Kiehl's Hydro-Plumping Re-Texturizing Serum Concentrate: Upon rubbing into the skin, water droplets appear! So, would I recommend this product, after having researched and written so much about this product and the science behind it? I'll say that the Kiehl's Hydro-Plumping Re-Texturizing Serum Concentrate, being a lightweight moisturizer, would be good for anyone who doesn't have dry skin (if you do, Kiehl's also has tons of other options, including their Ultra Facial Cream, or their Powerful Wrinkle and Pore Reducing Cream if you're really dry, and those are well-formulated, too). If you have oily to normal skin, and are looking for something light and easy to use for everyday wear, then this will be right up your alley, and you might find that you can probably even use it on its own as a moisturizer. If your skin is on the dry side, then you may prefer using this as a serum, layering it under another moisturizer of your choice. But whichever way you use it, if you do buy it and use it, you can marvel over the fact that the way the product releases its water is actually patented technology that's the fruit of the company's research! The Bottom Line:The Kiehl's Hydro-Plumping Re-Texturizing Serum Concentrate is a lightweight gel that breaks down and releases water on skin, making it a good everyday lightweight moisturizer for normal to dry skins, or a serum for all skin types under another moisturizer. Incredibly awesome review. I like the thought, and definitely the research, that was put into this. And as for the product, I think I might pass. I like the fact that your article uses facts and research to back up your opinions. For confused and therefore troubled consumers like myself just trying to find the cheapest, best products for my face it would be most helpful if you could end your article with some comparisons to other similar products in the market. Another words, if you don't recommend this product, which other 1 or 2 are better? I love this stuff! My skin needs the extra hydration boost. Especially under my eyes. I've stopped by the Kiehl's store a couple times and asked for sample packets for travel. As for the price... I just checked Costco.com and their price is $39.99 vs. the retail price of $58! I haven't seen it in the warehouse.